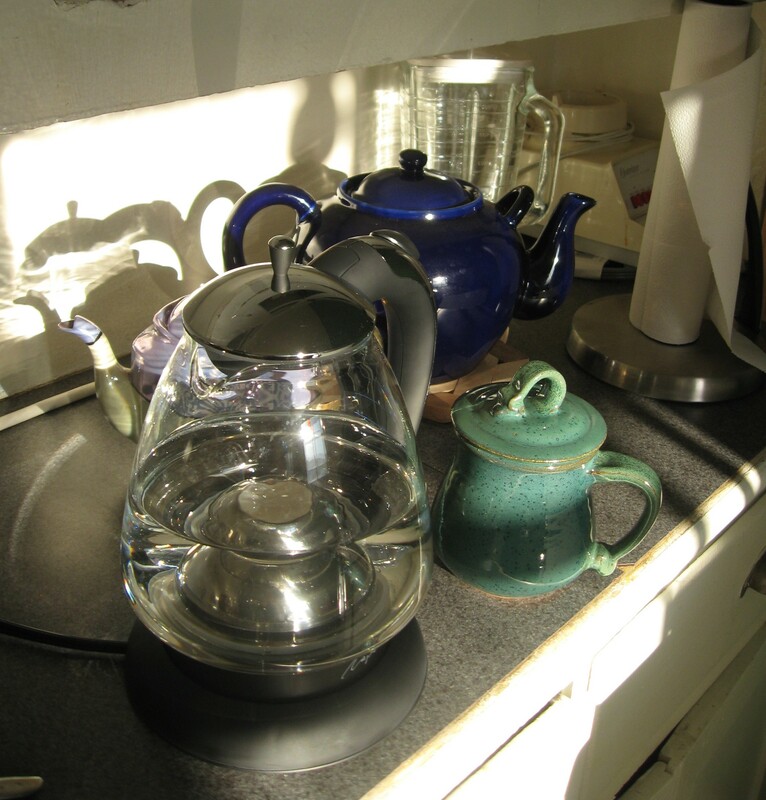 My teapot from J, tucked behind an electric kettle, another teapot, and a locally crafted mug, on my early morning countertop. I miss talking to J about my writing life. This afternoon I will concentrate on writing, I’d say. I’m deliberately ‘concentrating on,’ not ‘working on’–no more of the furrowed brow that ‘work on’ entails. She’d laugh. I used to have that furrowed brow, too; hell, look at my wrinkly forehead. J would talk about the struggle to get to her drawing, even with new chalks and paints around her, how daily chores and her own busy mind pulled her away from something she’d never had time for, yet couldn’t quite get to, even now. She’d encourage me to keep going, and I’d tell her more. When I give myself over to writing, or create space for it, then I can relax and play. It’s what I call Mind-Out-Of-Time, what I sometimes think heaven is or would be: you are so involved in something that clock hands move unnoticed, you look up and the afternoon light is bending across your desk and you gasp–how long have I been here? Mind-Out-Of-Time comes also when I choose to immerse myself in how life looks and feels, tastes, sounds and smells. It comes when I give myself permission to be right where I am, at that very moment, open to pleasure even in the midst of pain. So I think of J, steeping tea in her beautiful cobalt blue teapot, when I came to visit six months ago. Napkins in hand, she danced oxygen tubing between pieces of furniture as I carried the prepared cups and cookies to the front room. We laughed about how, on our last big trip, she’d pulled her portable oxygenator, nicknamed ‘Fred’ after her father, all over the up-and-down hills of downtown Vancouver. Fred sure got a workout, didn’t he? Took care of me just like Dad did. We discussed once again her wish to die at home. She asked after my teapot, a twin of hers, which she gave me when I moved away. Every time I make tea in it I think of you, I told her. Two weeks ago, her caregivers still made English Breakfast in her blue teapot; she rested in the home hospital bed, I held the mug, she sipped sweet lukewarm liquid with a straw. During the moments she was awake, she rolled her eyes sardonically, joking with only a few words about the little yellow curlers in her hair that looked like baby corn; I teased her back about how she finally got us all to wait on her hand and foot, and more seriously, how much we loved doing it. As she drifted into medicated rest, she murmured about death, it will be pleasant; it will be pleasant. See you on the other side. After the memorial service last weekend, I wrapped up the cobalt blue teapot in crinkly paper, to deliver it safely to her chaplain, someone who’d shared tea with her every Wednesday for many years, someone whom I suspect also understood mind-out-of-time with her. I took one of her mugs and packaged one for yet another friend. This morning, kitchen lights reflect on the curve of my round teapot as rain drips down the apartment windows. Cars splash black puddles up into the air outside. J’s goldenrod colored, cartoon-cat covered mug, full of toffee-chocolate-hazelnut tea, sits beside my keyboard. Guess what. I’m still talking to J about my writing life. This entry was posted in A+ Student Syndrome, Death and Grief, Food, Living in the Moment, The Writing Process and tagged A+ student syndrome, death, friendship, hospice, living in the moment, Mind-Out-Of-Time, perfectionism, tea, teapots, writing by of-the-essence blog. Bookmark the permalink. Nice post. The photo caught my eye. Tea for me is that great calming agent that makes me slow down like nothing else can do.